What is Talk Like a Pirate Day? Break out your best flask and cutlass and join us for Talk Like a Pirate Day. There’s something so enchanting about the idea of swashbuckling adventure upon the high seas. Maybe it’s the buried treasure, or the sandy beaches, or the spirit of freedom in the breeze. Or could it be the rum? Whatever the draw, we’ve fallen in love with pirates. But our modern ideas about pirates are often more romanticized than the real pirates of old actually deserved. The real pirates of the Caribbean were a fearsome smelly lot of amoral brigands looking to loot and pillage whatever vessels and coastal towns they could assail. They gambled, they cheated, they fought dirty, and they were no strangers to murder, mayhem, or syphilis. As the famous song goes, they really were devils and black sheep (and really bad eggs). But while real pirates were nothing to be adored, it’s still fun to growl, “Yarr!” and fling around some salty jibes with your modern mates. Talk Like a Pirate Day falls on September 19th every year, and has done since 2002! Easy to remember, which means you can focus all your attention on swashbuckling! Mundane activities become high-stakes gallivanting when you talk like a pirate. At the grocery store? Those potatoes are now booty you have plundered from the aisle. Stuck in traffic? Call out your favorite pirate insults. Need to vacuum? Pretend you're about to swab the deck. And once your to-do list is done, you can hold a contest with your friends to see who can come up with the most pirate-y phrase. Chances are, there's a pirate movie that you already love. If not, then "Pirates of the Caribbean" is a fun trilogy, and classic films like "Treasure Island" enhance the throwback feel of talking like a pirate. As the movie rolls, you can shout along with your favorite lines, or roam the high seas of your living room with a toy parrot on your shoulder. Just make sure to find a plastic cutlass or two before you cross swords with your friends. Let's face it — pirates are renowned for their drinking. Whether pints of ale, jugs of grog, or flasks of rum, pirates always seem to have a stiff swig on hand. Whatever your favorite cocktails, mix them up with the spirit of the high seas (and maybe add a splash of orange juice to ward off scurvy). But unlike the besotted pirates of bygone days, be sure to drink responsibly. For some reason, talking like a pirate is super fun. Something about how silly and unnecessary it is just makes it hilarious, and it's even more fun when you can get your friends to play along with you. 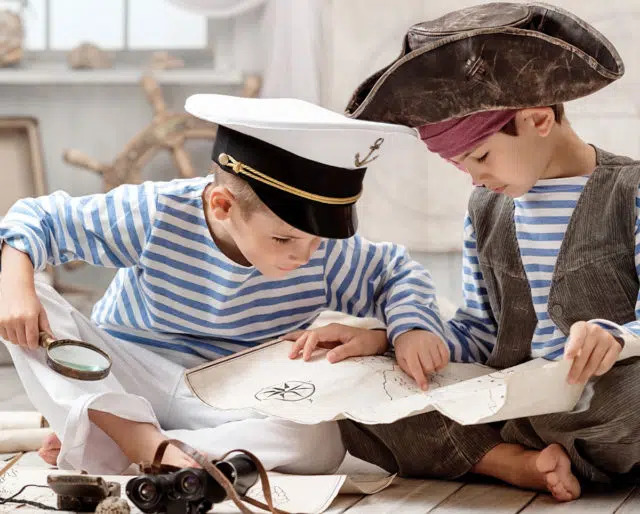 You'll all get to goof around with your day to day speech, and injecting a little pirate lingo into your life makes everyday tasks feel like shiny new adventures. It's nice to have an excuse to talk in a different way now and again. It's fun to play with accents and outdated phrases, but nobody wants to be the weird cuckoo at the bus stop who can't stop shouting, "Avast!" On Talk Like a Pirate Day, you have a legitimate reason to resurrect the briny old-school nautical lingo of pirates. Who doesn't love a good pirate movie now and again? From "Hook" to "Pirates of the Caribbean" to all of the "Pirates of the Caribbean" Sequels, just the starting theme of some pirate films is enough to stir up excitement. Practically everyone's got a favorite pirate adventure, but we usually don't watch them all that often. Talk Like a Pirate Day reminds us to gear up and swashbuckle along at least once a year.